Step one, touch the cat's nose. Step two, blow on the cat's face. Step three, say "meow", and then hiss at the cat, while still touching its' nose. If you have managed all of the above, then you have mastered the art of cat mind control, also publicly abbreviated as CMC. I know I am far from being the only cat owner on the planet. Well, I can't really call it ownership, eh. 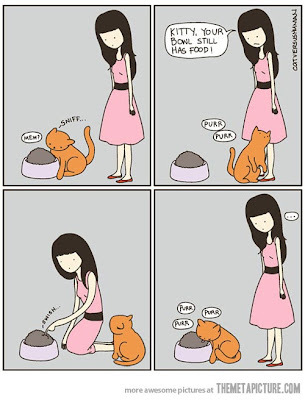 It is more like "living with a cat." I did not even adopt her. She adopted me. Came to my window one day; I keep an open window. She was just a pup (sorry, dog person) and was kinda cute, so I let her fuzz about. I suspect that her mother brought her over. Another, older looking, white cat tailed behind her, quietly watching. It sure can be hard, being a cat.